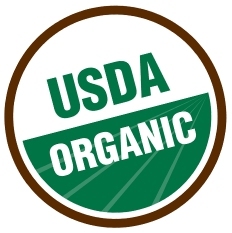 Organic Noni Product in the World! 100% PURE, Wild-Harvested Organic Noni Juice! In terms of utilizing the uncompromised power of nature, there is simply no more higher grade of 'natural' that can be achieved than those herbs or plants that are ethically harvested from their native, pristeen natural habitat. Never reconstituted! Never freeze-dried! Never altered or converted to a powdered form! Effective Noni Juice By Health Care Professionals! Noni100 is the only 100% pure, wild-harvested organic Noni juice that is fully supported by the research findings of one of the world's foremost scientific experts, Dr. Stephen Talcott, PhD., of Texas A&M University. Dr. Talcott's research and scientific studies have been published in numerous peer-reviewed scientific journals such as the Journal of Agriculture and Food Chemistry, Food Research International, and Food Chemistry. Cumulatively, the Noni100 product has over 40,000 hours in clinical research validating its use and effectiveness. 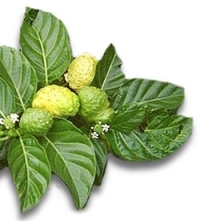 Additionally the Noni100 product uses only Wild Harvested ingredients. This means that only the highest quality Acai berries that are grown and gathered from their natural, native habitat in an earth-friendly manner are used within the product. In terms of utilizing the uncompromised power of nature, there is simply no more higher grade of 'natural' that can be achieved than those herbs or plants that are ethically harvested from their native, pristeen natural habitat. 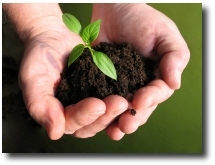 No man-made chemical or unnatural interventions; including growth hormones, herbicides, or pesticides are ever used. Have You Discovered the Healing Benefits of Noni? 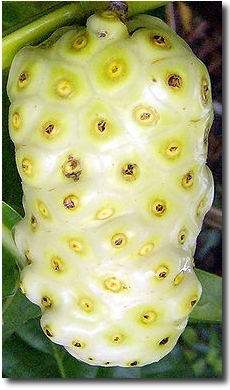 Noni is the common name for morinda citrifolia, a tropical fruit that grows year-round in the Pacific Islands. Islanders have used noni for thousands of years for its healthful benefits. No longer an island secret, noni has been studied for decades by renowned ethnobotanists, scientists, and medical professionals. They've discovered that noni works on a cellular level and affects nearly every system of the body. Noni100 juice is also a rich source of antioxidants. 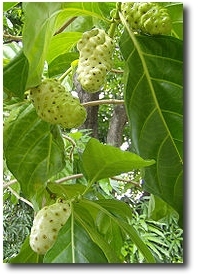 Noni grows and flourishes in tropical, volcanic regions such as Tahiti and Hawaii. The volcanic soil contains very high concentrations of minerals and other nutrients, which are absorbed into the noni fruit. The nutrients in the noni fruit are more powerful and nutritious than what most of us experience in our diet over an entire lifetime. Therein lies the source of noni�s amazing healing strength and abilities. The fruit juice has a very powerful, pungent taste and smell. Everything about Noni is STRONG, including it's medicinal effect on the human body. Noni has been used as a healing and medicinal plant for over 2000 years by ancient cultures. Its healing and restorative powers to the human body are legendary. It is akin to 'gold' in the South Pacific and is quickly gaining the same reputation in countries all over the world. "Over the last 20 years I've studied, researched, and used thousands of different herbs, plant nutrients, and nutritional supplements to achieve positive results with my patients. Out of all of these natural healing elements, Noni100, is by far, at the top of my usage list. It is very potent, effective, causes no side-effects, and has given me tremendously positive results with my patients in a very short period of time. Noni's usage range is astounding! To sum it up... if I was stranded on a desert island, and could only choose ONE health-building nutritional element to have with me, it would without a doubt, be 100% pure, aged, undiluted Noni." "Not only does Noni provide many benefits on its own, it acts as a delivery agent increasing the effectiveness of all other treatments and supplementation." "In my practice, I have found that Noni acts as a catalyst, increasing the benefit and positive effects of all other nutrients." "I have tried most Noni products on the market, and I am happy to say that Noni100� is the only Noni product that I take or will ever take. I drink Noni100 2 times every day and really notice a difference in the way I feel, both physically and mentally. I have more energy and endurance, and don't feel the aches and pains of my professional football career - I feel incredible. I'm a convert and a user for life." A virtual storehouse of nutritional benefits. Noni contains over 140 powerful vitamins, minerals and other nutrients that positively affect our bodies in many profound ways. Some of these positive effecting compounds include Acubin, Alazarin, Asperuloside, Anthraquinone, Bioflavinoids, and Glycosides. Unfortunately, due to Noni's increasing popularity and powerful benefits, there are many Noni companies on the market that have sprouted up - driven purely by sales and marketing. These types of companies are generally more interested in making money than making people healthy. The quality and integrity of the Noni is sacrificed, often resulting in inferior Noni juce, watered-down Noni juice, diluted Noni juice, chemically preserved Noni juice, improperly fermented Noni juice, overly sweetened Noni juice, and various other methods of bottling using the least expensive methods possible. If you want the full benefits of Noni, make sure you're getting 100% pure Noni! Not all Noni juices are created equal. ACETIN GLUCO-P, ACTIVATORS, ALANINE, ALIZARIN, ALKALOIDS, ANTHRAQUINONES, ARGININE, ASPARTATE, ASPERULOSIDE, BIOFLAVINOIDS, CAPRLYIC, CAPROIC ACID, CARBOHYDRATES, CARBONATE, CAROTENOIDS, CHLORORUBIN, CYSTEINE, CYSTINE, DAMNACANTHAL, ENZYMES, GLUCOPYRANOSE, GLUTAMATE, GLYCINE, GLYCOSIDES, HISTADINE, IRON, ISOLUCINE, LEUCINE, LYSINE, MAGNESIUM, METHIONINE, MORINDADIOL, MORINDINE, MORINDONE, MULTI-RECEPTOR, NORDAMNACANTHAL, PHENLYALANINE, PHOSPHATE, PLANT STEROLS, PRECURSORS, PROLINE, PROTEIN, PROXERONASE, PROXERONINE, RUBIADIN, SCOPOLETIN, SEOTONIN, SERINE, SEROTONIN, SITOSTEROL, SODIUM, TERPENES, THREONINE, TRYPOPHANE, TYROSINE, URSOLIC ACID, VALINE, and XERONINE. 100% Pure, Wild-Harvested Noni Juice. Uniquely processed using the traditional natural methods to extract its juice; this lab-monitored process ensures the highest potency of the 140+ active ingredients (enzymes, phytonutrients, trace minerals, and vitamins). Additional servings my be taken throughout the day if desired. Noni100 can be taken alone or mixed with your favorite natural fruit juice. Q: When you pick the Noni fruit straight off the tree, is it sweet or bitter? A: Bitter. 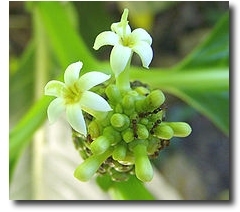 100% of the time, with no exceptions, the Noni fruit is bitter and not sweet. Q: Is Noni safe to give to all my family members? A: Yes. Because Noni is a pure fruit juice, it is safe to take by people of all ages. Q: Can I take Noni along with other dietary or nutritional supplements? A: Yes. Noni is a very important part of an effective dietary health regime program, and in addition to its own incredible health benefits, it may also help increase the absorption and assimilation of any other supplements you may additionally be taking. What Makes Noni100 the Superior Noni Dietary Supplement? 100% PURE wild-harvested organic Noni juice! No added fruit juices, sweeteners, sugars, preservatives, water, or anything! An amazing 30,000 mg of pure Noni in every 1 fl. oz. serving. Very high in organic trace minerals, with over 160 nutrients and other compounds. The pure, unadulturated Noni fruit - never reconstituted or powdered. Reducing Noni to a powder form may in fact damage important nutritional properties. Strong historical use as a therapeutic food source by the indigenous inhabitants of the Polynesian islands. Picked, aged, and juiced the natural way it has been done traditionally for the past 2,000 years by the indigenous islanders of the South Pacific. The most pure & clinically researched organic Noni product in the world (over 40,000 clinical research hours). Recognized as the #1 most potent, effective Noni juice By health care professionals. Analysis show that one bottle of Noni100 is equal to between 3 and 8 bottles of Noni produced and marketed by various other companies. Click to add Noni100 to shopping cart!